How Did Life On Earth Get Started? Three papers co-authored by Mike Russell at NASA's Jet Propulsion Laboratory strengthen the case that Earth's first life began at alkaline hydrothermal vents at the bottom of oceans. Scientists are interested in understanding early life on Earth because if we ever hope to find life on other worlds - especially icy worlds with subsurface oceans such as Jupiter's moon Europa and Saturn's Enceladus - we need to know what chemical signatures to look for. It might be easier than previously thought for a planet to overheat into the scorchingly uninhabitable "runaway greenhouse" stage, according to new research by astronomers at the University of Washington and the University of Victoria published July 28 in the journal Nature Geoscience. The chemical components crucial to the start of life on Earth may have primed and protected each other in never-before-realized ways, according to new research led by University of Washington scientists. We use the sample of known stars and brown dwarfs within 5 pc of the Sun, supplemented with AFGK stars within 10 pc, to determine which stellar spectral types provide the most habitable real estate - defined to be locations where liquid water could be present on Earth-like planets. High-precision eclipse spectrophotometry of transiting terrestrial exoplanets represents a promising path for the first atmospheric characterizations of habitable worlds and the search for life outside our solar system. Valley networks branching across the Martian surface leave little doubt that water once flowed on the Red Planet. But where that ancient water came from -- whether it bubbled up from underground or fell as rain or snow -- is still debated by scientists. A new study by researchers at Brown University puts a new check mark in the precipitation column. Purple bacteria contain pigments that allow them to use sunlight as their source of energy, hence their color. Small as they are, these microbes can teach us a lot about life on Earth, because they have been around longer than most other organisms on the planet. Most stars and their planets form in open clusters. Over 95 per cent of such clusters have stellar densities too low (less than a hundred stars per cubic parsec) to withstand internal and external dynamical stresses and fall apart within a few hundred million years. Conventional scientific wisdom has it that plants and other creatures have only lived on land for about 500 million years, and that landscapes of the early Earth were as barren as Mars. Chemical kinetics plays an important role in controlling the atmospheric composition of all planetary atmospheres, including those of extrasolar planets. For the hottest exoplanets, the composition can closely follow thermochemical-equilibrium predictions, at least in the visible and infrared photosphere at dayside (eclipse) conditions. An International Collaboration of FACom researchers and astronomers of the University of Texas (El Paso) and New Mexico State University have discovered a physical mechanism that could make binary stars more hospitable to habitable planets than single stars. Moons orbiting extrasolar planets are the next class of object to be observed and characterized for possible habitability. Like the host-planets to their host-star, exomoons have a limiting radius at which they may be gravitationally bound, or the Hill radius. We describe the contents and functionality of the NASA Exoplanet Archive, a database and tool set funded by NASA to support astronomers in the exoplanet community. Stars interact with their close-in planets through radiation, gravitation, and magnetic fields. We investigate the energy input to a planetary atmosphere by reconnection between stellar and planetary magnetic fields and compare it to the energy input of the extreme ultraviolet (EUV) radiation field of the star. Solving the "faint young Sun paradox" -- explaining how early Earth was warm and habitable for life beginning more than 3 billion years ago even though the Sun was 20 percent dimmer than today -- may not be as difficult as believed, says a new University of Colorado Boulder study. Lake Vostok, the 7th largest (by volume) and 4th deepest lake on Earth, is covered by more than 3,700 m of ice, making it the largest subglacial lake known. The combination of cold, heat (from possible hydrothermal activity), pressure (from the overriding glacier), limited nutrients and complete darkness presents extreme challenges to life. Cycle 7 Cooperative Agreement Notice NNH13ZDA010J: On or about July 3, 2013 The National Aeronautics and Space Administration (NASA) Science Mission Directorate is releasing a Draft Cooperative Agreement Notice (CAN) soliciting team-based proposals for membership in the NASA Astrobiology Institute (NAI) for community review and comment. Transmission spectroscopy of exoplanets is a tool to characterize rocky planets and explore their habitability. Using the Earth itself as a proxy, we model the atmospheric cross section as a function of wavelength, and show the effect of each atmospheric species, Rayleigh scattering and refraction from 115 to 1000nm. Red dwarf stars are the commonest type of stars, making up about 75% of the stars in our galaxy. They are much smaller and much less massive than our Sun and for that reason a lot dimmer. 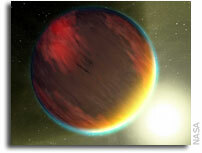 If planets are found around these stars, then given the number of red dwarfs, life could then be commonplace. A new study that calculates the influence of cloud behavior on climate doubles the number of potentially habitable planets orbiting red dwarfs, the most common type of stars in the universe. This finding means that in the Milky Way galaxy alone, 60 billion planets may be orbiting red dwarf stars in the habitable zone. When the ROSES-2013 omnibus solicitation was released, the Astrobiology Science and Technology for Exploring Planets (ASTEP) program included a notice at the top that said in part "NASA may solicit research proposals under this program..." and the due dates were listed as "TBD." We regret to inform proposers that ASTEP will not be solicited in ROSES-13 due to a lack of funding.